Paul Aaron Lindblad (Aug. 9, 1941 – Jan. 1, 2006) was an American left-handed middle-relief pitcher in Major League Baseball who played primarily for the Kansas City and Oakland Athletics (1965-71, 1973-76). He also played for the Washington Senators/Texas Rangers (1971-72, 1977-78) and New York Yankees (1978). Upon his retirement in 1978, he had recorded the seventh-most appearances (655) of any left-hander in history. Lindblad was born in Chanute, Kansas. A member of three World Series championship teams, he was a solid left-handed specialist in the American League for 14 seasons. A very fine fielder as well, he set a major league record by going from 1966 to 1974 without making an error in 385 games. 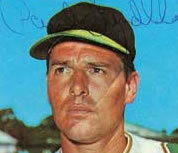 Lindblad was signed by the Kansas City Athletics in 1962, who moved to Oakland in 1968. His most productive season came in 1969, when he posted career highs with nine wins and nine saves. A year later he followed with a 8-2 mark, and in the 1971 midseason he was traded to the Washington Senators, who became the Texas Rangers a year later. With Texas, he led American League pitchers with 66 appearances in 1972. He returned to Oakland at the end of the season. Lindblad was the winning pitcher for Oakland in Game Three of the 1973 World Series against the New York Mets, by working shutout baseball in the ninth and tenth innings. In the 10th, he became the last pitcher faced by future Hall of Famer Willie Mays, who grounded out as a pinch-hitter. In 1975, Lindblad had a 9-1 record with seven saves. On the final day of the regular season, he combined with Vida Blue, Glenn Abbott and Rollie Fingers on a no-hitter against the California Angels. He appeared in two games against the Boston Red Sox in the ALCS. Lindblad came back to Texas for part of two seasons and made his final majors appearance with the Yankees in Game One of the 1978 World Series. He finished his career with a 68-63 record and 64 saves in 665 games. He posted a 3.29 ERA and struck out 671 batters in 1213 2/3 innings pitched. Following his playing career, Lindblad joined the minor league baseball system as a pitching coach, and also worked as a custom homebuilder for several years. Lindblad died from Alzheimer's disease in Arlington, Texas at the age of 64.